This 1950s style cap was traditionally worn by the soda jerk, the counter worker in an old fashioned soda fountain. Wear these caps while creating your favorite soda fountain treats. It is made of 100% cotton and is machine washable. 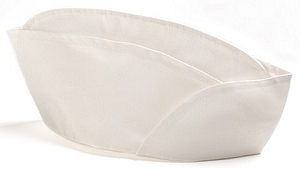 The clean white color looks great with our soda jerk waist apron or bib apron. Save 20% off the regular price when you order 10. Hats were delivered timely and exactly what we were looking for. thanks! Bought to make Steve Martins' gas station hat from the movie The Jerk. The BEST quality of its kind ANYWHERE online! Great Hat, My customers love it. As advertied, this is an authentic old fashioned soda jerk hat. I was worried about the "one size fits all" but it fits fine. If you want one, here it is. My husband was Navin R Johnson for Halloween. This is the only place I could find this hat. It was exactly what we needed. The quality and size was good. The price is great and we got it within a week! I am very happy with my purchase. this hat was exactly what i was looking for and this was pretty much the only place online i was able to find it. the hat was of good quality, looked exactly like the online picture, and arrived in a timely fashion. Very hard to find these type of caps. Super quality. Thank you Prarie Moon for offering this product. Really appreciate your top notch service also. Bravo! Very good quality cloth. This can be washed and re-used, much nicer than the paper hats. Came is as order, good quality - fit well. This item was perfect for an opera I designed that took place partially in a soda shop! My crew and I love these hard. They're beautifully base, the stitches are sturdy. We haven't washed them yet so I'm but sure how that will go but I have no reason to think it won't go well. I plan to order these again and again. I just love the authenticity this hat gives out look. Well done guys. Awesome quality at a great price. Can't find anywhere else at this price including shipping. Hat was perfect for my granddaughters Halloween costume. She was a 50's Diner Waitress and the hat made the outfit. It came quickly and was exactly as described. Looks just like the picture! Shipped fast. It was just what I was looking for ! This cap was perfect! Used it for a costume we made for my husband for an 80s party . . . He was Navin R. Johnson from the movie The Jerk. This was a hard item to find, but worth looking for! Had it professionally stitched for the costume and it held up perfectly! This hat is really well constructed and just what I was looking for. if you've found it, you probably know how hard this item is to locate; most are paper or cardboard. Thanks for a GREAT product! Good quality and perfect for that soda jerk look at a Nifty 50, 60 bash in Honolulu. Perfect item for the Apothecary in our Cinderella tale - Lucinda in Jam Town!